Observe: By exploring the status quo within an organisation, project or team, I assess the organisational framework conditions and requirements, the team’s current skills and culture, and the project plan, through dialogue and empathic listening. Comprehend: Perceiving and contextualising the situation, drawing conclusions, and forming hypotheses. Plan: Design of participatory development processes and learning architectures, as well as individual modules and workshops in relation to organisational, team, program and campaign development. Act: Facilitation of large-scale events, as well as workshops and digital modules, for the implementation of development processes and learning architectures. Advising executives on leadership, team and campaign development. This is a continuous learning and development loop, both from the perspective of the consultant and the customer. This cycle also informs the campaign planning processes I lead, the projects I develop, and my learning architectures and detailed learning designs. 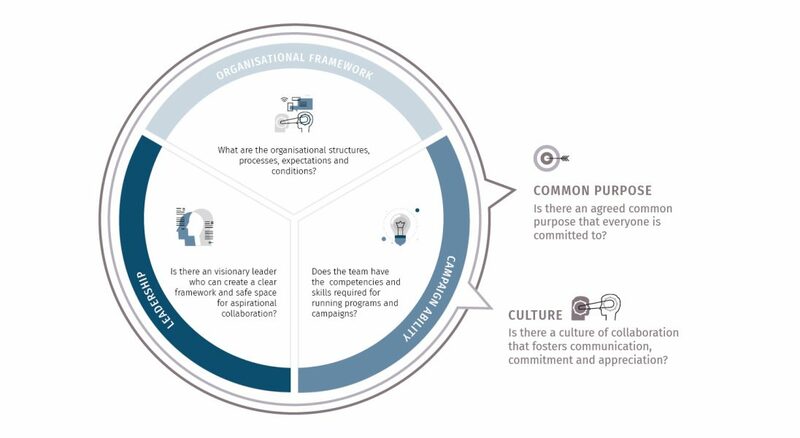 Systemic approach: This is the basis of my work with organisations, teams and leaders. It describes systems based on how we relate to and interact with our environment. In this way, new perspectives and attitudes open up, creating new possibilities for action for people and organisations. Strategic campaign planning: In order to develop compelling campaign strategies, I take my clients through an in-depth strategic planning process. This includes, among other things, a comprehensive situational analysis, setting of long-term goals, and developing a ‘critical pathway’ to describe the campaign strategy. Outdoor and nature context: Working outdoors and in nature offers a rich resource of inspiration that I harness to foster development for teams and individuals.